A wild ride of an NCAA Championships comes to a head tonight, with the final session about to kick off in Austin. We’ve got 7 events on the agenda for tonight, starting with the final heat of timed final miles – that includes top-seeded Bobby Finke of Florida, along with last year’s runner-up Felix Auboeck. The highlight might be the 200 breast, where 200 IM/200 free champ Andrew Seliskar goes up against 100 breast champ (and defending 200 breast champ) Ian Finnerty of Indiana. 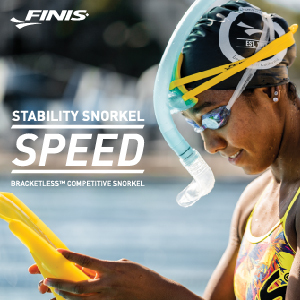 Finnerty won a shootout with Seliskar last year as the two swam polar opposite races: Finnerty went out like a rocket and fell off big-time near the end, while Seliskar let Finnerty get too far away early and couldn’t quite complete the comeback despite a furious final 100. They get a rematch tonight with two rookies – Minnesota’s Max McHugh and Cal’s Reece Whitley – on either side of them. 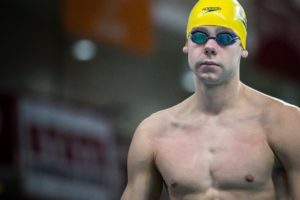 Seliskar is probably the frontrunner for Swimmer of the Meet – but if there’s a challenger, it’s Harvard junior Dean Farris. Farris won the 100 back in a stunning time last night, and also set an American record leading off the 800 free relay on day 1. He’s the top qualifier in the 100 free, looking to become just the 5th man ever under 41. 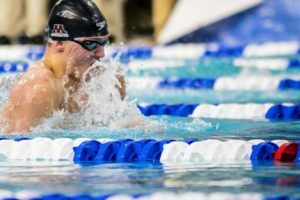 He’s followed by Minnesota senior Bowe Becker and Texas freshman Daniel Krueger, though we also expect Indiana’s Zach Apple (second in the 100 free) to make a charge. In the 200 back, Texas looks to reprise its 1-2 finish from last year: Austin Katz and John Shebat qualified in the top two spots this morning after finishing that way a year ago, but Cal sits 3 and 4 with sophomores Daniel Carr and Bryce Mefford. And in the 200 fly, NC State’s Andreas Vazaios is in line for repeat win after being the only swimmer under 1:40 this morning. 100 fly champ Vini Lanza of Indiana should put up a good fight, along with standout Louisville sophomore Nicolas Albiero. Albiero is the 2-seed, Lanza tied for the third spot with Virginia’s Zach Fong. We’ve got a platform dive showdown between 2018 NCAA champ Colin Zeng and 2017 NCAA champ David Dinsmore, followed by a 400 free relay where NC State is the defending champ, Cal the top seed and Indiana and Texas both lurking. 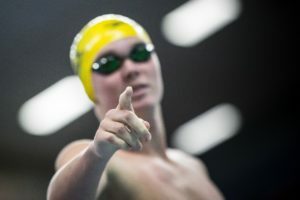 Michigan’s Felix Auboeck bounced back from a rough 500 free in the best way possible: he swam a gutsy, strong 1650 free, sticking right at NCAA record pace to win by four seconds. Auboeck was 14:23.09 – six seconds faster than his runner-up time last year, and two tenths off his lifetime-best, put up in another runner-up performance back in 2017. Auboeck’s best time ranks him 3rd all-time in the event. Indiana freshman Michael Brinegar represented what might be one of the better distance recruiting classes we’ve ever seen nationwide. He was 14:27.50 for second place, cutting four seconds from his lifetime-best. Cal’s duo of Nick Norman and Sean Grieshop went 3rd and 4th. Grieshop had the fastest time out of the afternoon heats, going 14:35.82. And in a show of teamwork, he actually counted the laps for Norman, who bested that time in tonight’s final heat, going 14:32.12. Norman is third for a second-straight year, and Grieshop moves way up from an 11th-place finish last year. Virginia’s Brendan Casey capped off a big meet with a fifth-place showing in 14:38.42, actually a second off his seed time. Behind him was another afternoon heat performance: a 14:38.92 from Marcelo Acosta of Louisville. Also finishing top 8: Stanford’s True Sweetser and Georgia’s Walker Higgins, both from an afternoon heat. Texas’s lone entrant in the final heat gained 15 seconds and missed scoring, so Cal will extend its points lead to 74. Cal’s Bryce Mefford came back hard to take third in 1:38.65. He was fourth last year, though he was actually two tenths faster a year ago. His teammate Daniel Carr finished 5th in 1:39.33. NC State’s Coleman Stewart was right in between, going 1:38.81. Both Stewart and Carr were B finalists a year ago. Florida’s Clark Beach had a big swim for take 6th – that’ll help Florida try to run down Louisville for 5th as a team, though Louisville seems set up with more scoring swims tonight. Beach is one of four sophomores in the top eight in this event, joining Katz, Mefford and Carr. Hawaii’s Kane Follows was 7th and Arizona State’s Zachary Poti 8th. In the B final, Texas’s Ryan Harty picked up the win in 1:39.40, besting Wisconsin junior Cam Tysoe (1:39.97). Cal now leads by 54. 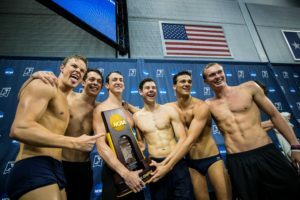 If they extend their lead to 78 during either the 100 free or 200 breast, they’ll mathematically clinch at least a share of the title. Harvard’s Dean Farris showed his incredible closing speed, torching his way home in 21.38 to go 40.80, the #3 swim of all-time. 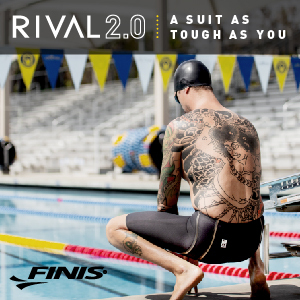 That’s Farris’s second win, and he also had the meet’s best 200 free on day 1, though he didn’t swim that event individually. 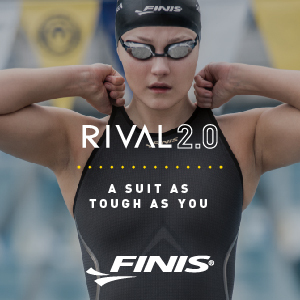 Farris, an elite 200 freestyler who was only 6th in the 50 free, was expected to close hard. What was maybe more surprising was the closing speed from Minnesota senior Bowe Becker, more known as a top-tier 50 guy. Becker actually outsplit Farris over the final 50, going 21.35 to finish second in 40.83, nearly running down Farris for the title. Becker moves to #4 all-time in the event. Indiana’s Zach Apple was 41.45 for third place. That’s just a tenth off his lifetime-best, done at this meet last year while swimming for Auburn. Behind him, Texas freshman Daniel Krueger just about matched his huge prelims swim, going 41.56 to stay within a tenth of his best time. Krueger was fourth. Alabama’s Robert Howard (41.75) and Cal’s Ryan Hoffer (41.82) also got under 42. NC State senior Justin Ress was 42-flat, and Cal’s other entrant, Pawel Sendyk, rounded out the heat in 42.06, three tenths off his prelims swim. In the B final, Texas senior Townley Haas cracked 42 to win in 41.96. That’ll be the last individual event at NCAAs for Haas, who has been a six-time champ between the 200 and 500 frees. Texas’s big event kept Cal from mathematically clinching just yet. The Cal lead stands at 53, meaning if they score 25 points in the 200 breast, they’ll clinch at least a share of the team title. They’re currently projected to score 42 in that race. Minnesota’s Max McHugh also surged home down the stretch, going 1:49.41 to move to #6 all-time as a freshman. McHugh has had a stellar meet so far, with his second top-3 finish and top-5 swim all-time. Finnerty wound up third, still besting his winning time from last year in 1:49.90. He becomes the 7th man ever to break 1:50. Fourth-place Caio Pumputis of Georgia Tech also cracks the top 10 in history – he sits 10th now after going 1:50.79. Prior to this week, fifth-place Reece Whitley would’ve been a top-10 perfomer all-time, but he’s just outside now after going 1:50.84. That’s still a drop, though, from his incredible high school time of 1:51.4. Paul DeLakis of Ohio State was sixth (1:52.05), followed by Texas A&M’s Benjamin Walker and Georgia’s James Guest. Michigan’s Charlie Swanson won the B final in 1:52.09. Finishes of 1st, 5th and 16th for Cal has officially and mathematically clinched the team title for the Golden Bears. They could DQ every event from here on out and still win the meet. NC State’s Andreas Vazaios used some massive underwaters to defend his 200 fly title and give NC State its first event win of the meet in the very last individual event. Vazaios was 1:38.57, bettering his winning time from last year by .03. He remains the #3 performer of all-time, and this swim now gives him the #4 and #5 performances of all-time. Indiana’s Vini Lanza also went a tick faster than he did last year – he was 1:39.63 and should become the #7 performer of all-time, pushing past a guy named Michael Phelps on that list. Cal’s Zheng Quah led at the 100, and though Vazaios and Lanza passed him late, he held on for third in 1:39.68. That’s faster than he was here last year, though still not as fast as his 1:38.8 from his freshman season. ACC rivals Nicolas Albiero (1:40.08) and Zach Fong (1:40.28) came next for Louisville and Virginia, respectively. Albiero dropped a tenth from prelims, Fong gained a tenth. Cal’s other A finalist was Trenton Julian, who moved up one spot from last year to take sixth, though he was actually a tenth faster a year ago. Interestingly, he hit the exact same time – 1:40.94 – in both prelims and finals. Towson’s Jack Saunderson finished 7th, launching his team from 42nd to 31st in team points. And Georgia’s Camden Murphy finished 8th. 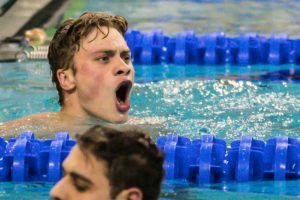 Ohio State’s Noah Lense won the B final in 1:40.79, cutting eight tenths from his prelims swim to beat Cal’s Mike Thomas (1:41.15). While the top 6 feel pretty locked in, the battle rages for the last few spots in the top 10. Alabama is six points ahead of Harvard for 7th. Virginia is 12 back of Harvard and Michigan 9 back of UVA. From there, 11th-place Stanford is a mere two points behind Michigan (and will earn one point from diving) and tied with Missouri. Texas A&M is two back of that tied duo, but doesn’t have any scorers left. Tennessee should vault ahead of all of them if Colin Zeng wins diving or finishes second. Texas sophomore Jordan Windle continued what’s been a good night for the Longhorns overall – he won the platform dive title by seven points over 2017 champ David Dinsmore. Miami’s Dinsmore was 440.75 and Windle 447.00. Miami also took fourth with Zach Cooper‘s 407.80, while LSU’s Juan Hernandez bounced back after missing scoring on 3-meter yesterday to take bronze overall. The dive event has launched Ohio State into the top 10. They are a point ahead of Tennessee, with Michigan three back, Stanford four and Missouri five. It hasn’t been the best of meets overall for Texas, which saw its four-year team title run snapped by Cal. But the Longhorns finished with easily their best session, capped by back-to-back wins. They made a bold relay call, swapping out freshman Drew Kibler (who has generally been good on relays this week) for John Shebat, not as well-known as a sprint freestyler, but who has been on fire in his final meet as a collegiate Longhorn. It paid off, as Shebat split a crushing 41.6, handing off to two fellow seniors who broke 41: Tate Jackson was a bruising 40.9 and Townley Haas 40.7. That capped off a 2:45.12 relay win for the Longhorns, joining a 41.7 leadoff from freshman Daniel Krueger. NC State finished second as senior Justin Ress made a huge charge on the field while anchoring. He was 40.96, joining Jacob Molacek (41.91 leadoff), Coleman Stewart (41.9) and Nyls Korstanje (41.4). 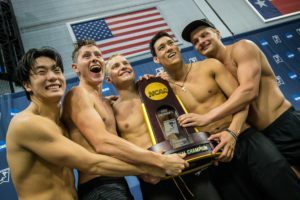 Cal was third overall – Andrew Seliskar anchored in 41.1, and their tough sprint duo of Pawel Sendyk (41.9) and Ryan Hoffer (41.4) powered the middle of the relay after 42.1 leadoff man Michael Jensen. Indiana led early on a 41.4 leadoff from senior Zach Apple, and got a 41.5 anchor from Bruno Blaskovic to take fourth in 2:47.22. A 41.8 split on the third leg from Emir Muratovic pushed Florida State to fifth, and Louisville was sixth, getting a 41.8 of their own on the end from Zach Harting. Ohio State caps a great session in 7th, with Andrew Loy leading off in 42.1, while Arizona State was eighth, getting a pair of 42.3s to lead their relay. In the B final, Dean Farris led off for Harvard in a blistering 40.91, but Alabama’s Zane Waddell threw down a big 42.0 anchor leg to run down the Crimson at the end. Alabama was 2:48.92 and Harvard 2:49.88. Robert Howard was 41.74 leading off for Alabama. Cal wins the overall title by 85 over Texas. Indiana is third and NC State fourth, as they were most of the meet. Louisville did top Florida for 5th, with Alabama outlasting Harvard for 7th. The really interesting pieces come after that. A huge performance by Ohio State pushed them all the way to 9th as a team, and Virginia also snagged the last top 10 spot by just a point over Tennessee and Missouri. It was incredibly close for the last top 10 spots, with just 13 points separating 17th from 10th and just 25 separating 10th from 20th. Cal wins 3 ncaas in a row at Texas Cal probably wishes ncaas were here every year. Cal loses ncaas four years in a row to Texas and finally gets a win this year. Yes, I’m sure Cal would like to cherry pick years and omit all the years they lost to Texas. Congrats to Cal for getting a win. Enjoy it! Good question. What did Cal do the last 4 years they lost to Texas? Oh, I know. Cal fans whined like crybabies. What a meet for Grieshop. 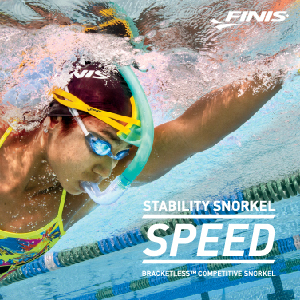 Dropped 2.5 seconds in the 500, 5 seconds in the 400im and 7 in the 1650. Seliskar will no doubt be the Cal MVP, but Grieshop’s been really good and moved up on his seeds all meet long. Seliskar’s performance is not a surprise, but Grieshop has been one of Cal’s best swimmers this week. When I read that Grieshop counted for his teammate in the mile, I wasn’t surprised. At every swim meet, big or small, that Sean swam here in Austin over the years, he never failed to thank the timers in his and other lanes. A true gentleman. That is very cool to hear. After working USA Swim meets timing, officiating, announcing, playing deck cop in the bulkhead, watching the warm up pool, anything else they ask me to do for the past five years, I had a top ten in the country age grouper get out after losing an A final in the state championships, look me in the eye and thanked me for timing for the first time in those five years. So classy. Grieshop is only going to get better! 40.7 or better for the win!